Roundabouts. They’ve been used successfully for decades throughout the world, and they’re becoming an increasingly popular way to control traffic in British Columbia, too. 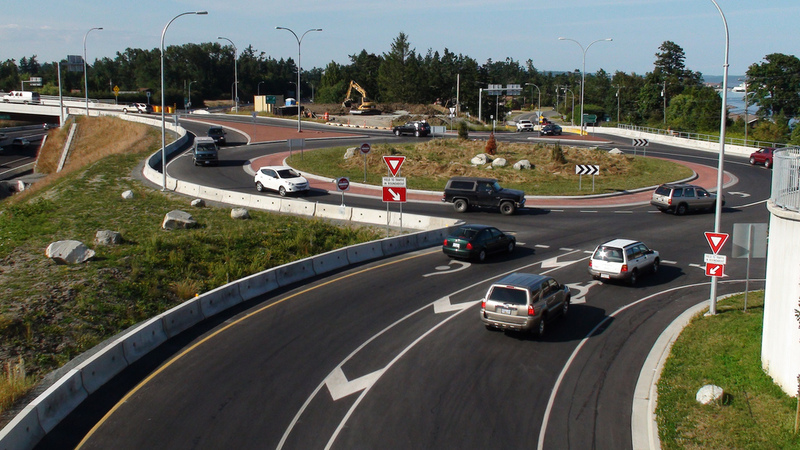 For a variety of situations, such as a considerable volume of traffic making left hand turns at an intersection or a significant history of collisions, a roundabout is a preferred choice rather than traditional intersections. Roundabouts reduce the potential for a serious crashes, like being t-boned or hit head on. In fact, studies have shown that roundabouts have 35 percent fewer crashes, 90 percent fewer vehicle fatalities and 76 percent fewer vehicle-related injuries. With numbers like those, it’s easy to see why roundabouts are becoming more common. Approach: Reduce your speed, watch for signs and watch for people and cyclists. Yield: Yield to traffic in the roundabout. Enter: Enter the roundabout to your right and continue counter-clockwise until you reach your exit. Do not stop once you are inside the roundabout. If you need to pull over (if an emergency vehicle is in the roundabout and trying to get by, for example) exit and pull over to the side. Exit: Use your right turn signal to exit, watch for pedestrians and cyclists and be ready to stop. If you’d like to find out more, we’ve got a useful roundabouts page you might want to have a look at. It’s loaded with information, including animations and video that shows exactly how roundabouts are used. I am confused about the roundabouts. If there is a car I front of me is entering the roundabout and there are other cars who are waiting to enter the roundabout, do I stop and let the waiting cars go into the roundabout or do I just follow the car in front of me and enter the roundabout? Some of the drivers are just entering the roundabout without stopping even if there are cars that were waiting first. Which way is correct? Unlike a traditional intersection, the beauty of the traffic circle is that the circle can accommodate more than just one vehicle at a time. As long as you yield to traffic already moving inside the circle, you can squeeze into the circle when there is space to do so. Each car waiting to enter should be moving into the circle as soon as a space opens up in front of their entrance point. If there is no break in the traffic inside the circle, you will have to wait until there is one and then move into the circle when it is safe to do so. Make sense? I often come across traffic circles (apparently different from roundabouts) and am worried every time due to the confusion about the rules there. Often people don’t stop, don’t yield to vehicles in the traffic circle, or bizarrely stop half way around to yield to cars not yet in the circle. I am from the UK (where roundabout and traffic circles have the same rules and since we drive on the left the rule is to “give way to traffic on the right”). So I have always approached traffic circles as I would a roundabout following the rule which in BC is to yield to traffic already in the circle (or coming from the left) this is all fine. The rules becomes confusing when two (or more) cars arrive at the same time at a traffic circle, at such a time the rule then switches to yield to traffic on the right, as if it were a 4 way stop. Why is the rule this way? This is confusing. The rules actually state that vehicles must sometimes yield to cars coming from the left, sometimes yield to cars on their right. No wonder people are getting it wrong. Often it is not clear who arrived first so two vehicles might sit there yielding, or both might go. And what if someone is already using the traffic circle and 3 arrive at the same time and are waiting, some are yielding left, some are yielding right. A traffic circle looks very different to a 4 way stop intersection so why do the rules muddle here? If the rule was always simply “Yield to traffic coming from the left” it would be much easier to understand and I think folk would have an easier time navigating traffic circles. Hi can you clear something up for me please. if I am waiting to get into a traffic circle( single lane) with four points of access and their are 3 cars lined up waiting at each access point to get in. I know the guy who got there first goes first or if at same time the guy on right goes first. so lets say the north guy goes first once he is in should the next car to enter should be car 1 the east access point and car 2 at the north should wait and let him in? so all 1 cars at north east south and west go into the circle than car 2 north east south west enter than car 3 north east south west. I thought if there was someone waiting to get into the circle as you approach the circle you need to yield and let them into the circle because they where their first? but I find that every one just rides every ones bumper and never leaves a gap which just creates a big train of traffic going one way. I hope that this makes sense. Hi Mark. Thanks for your question. Always keep the central rule in mind: traffic entering the roundabout must yield to traffic in the roundabout. If you approach the roundabout at the exact same time as a vehicle entering from your left, you likely have enough space to proceed because you are entering ahead of the other vehicle. It would be up to you to determine if entering the roundabout would interfere with the movement of the other vehicle. In europe, cars in the circle must yield to a car getting in. Otherwise you might never be able to get into the circle if it’s rush hour. The same for onramps. I’ve never understood why we got this very wrong in Canada. It seems incredibly STUPID to have traffic circles and traffic roundabouts have different rules for yielding. Make all circles and roundabouts yield to the left and signal right when exiting. No other rules required? I have to agree with many others in this discussion, if you read from start to end the info. given by tranbceditors contradicts itself and only serves to confuse us further. Once a set of rules that applies to both circles and roundabouts the same is sorted out then start an education campaign to teach all of the correct use these intersections. I also lived in England and really appreciate roundabouts, but it looks like the rule makers here are making it up as they go along,or they have copied British rules for right-hand drive roads without adjusting to left-hand drive. Roundabout driving here scares me because people don’t know the rules or can’t be bothered to use them, or the rules don’t make any sense, like with the lane changing discussion at the top. Thanks for your comment. Is there language specifically which you would like us to revisit, or direction in our wording which we could improve to make things clearer? One thing that seems to confuse drivers is yielding vs merging, when there’s a backup. Let’s suppose we have traffic entering from the south of the roundabout, the majority of these drivers are exiting to the north and to the west. Nobody is coming from the left, so they proceed. There’s traffic backed up at the east entrance of the roundabout; the majority is proceeding either north or west. Supposing no one appears from the west (or north), would the drivers entering from the south continue to have the right of way? In this situation, I’ve seen drivers from the south stop in the roundabout and wave the eastern drivers in; this does not seem like a good idea. What should the drivers from the south do? Thanks for connecting with us here and sharing your concern. Traffic on the outside of the circle must yield to the traffic inside the circle. If traffic inside the circle slows and stops, those outside the circle cannot merge into the circle. They must wait until there is an opening in the flow of traffic already inside the circle (i.e., once the traffic moves out of the circle to the north or west). Traffic inside the circle should not wave in traffic from outside the circle. Vehicles inside the circle should complete their turn and move out of the circle, so others can enter. Hope that this helps. To clarify, let’s suppose we have a long stream of traffic entering from the south of the roundabout; they’re not exiting at the east exit. There’s traffic backed up at the east entrance of the roundabout. Supposing no one appears from the west (or north), would the drivers entering from the south continue to have the right of way? If there is an opening inside the traffic circle to your immediate left (regardless of which point of entry you are at), you can enter the circle. The only right of way in a traffic circle belongs to vehicles travelling inside the circle. Hope that this helps. Here’s another blog with a simulator of a roundabout that you might find helpful: http://tranbc.ca/2012/07/20/right-right-and-you-will-be-alright-on-roundabouts/#sthash.Wns1jbQu.dpbs Hope that this helps! So in other words, when I ask “Supposing no one appears from the west (or north), would the drivers entering from the south continue to have the right of way?”, the answer is yes? Okay, I’m super confused now! 🙂 In Langford, we have a roundabout on Goldstream. It’s one lane. If I’m leaving at the 3rd exit (basically, a left if there were no circle), I don’t signal left at any point, do I? I just enter when safe and then signal right as I leave, yes? And is that different from a traffic circle? At a traffic circle, do I signal left? I know to treat it like an uncontrolled intersection, yielding to the right, but do I signal left if I’m going to the third exit? You are correct. Signalling when you intend to exit (with your right blinker) is sufficient to warn people you will be leaving the circle. We understand that traffic circles are somewhat new to folks in BC, but over time we think it using these circles will become second nature. Happy trails. I am having a difficult time understanding why you would yield to the right if you and another vehicle arrived at the same time, in a one lane traffic circle?!? It should always be “give way to the left” as this keeps the traffic flowing and then there is no confusion of who got there first. I lived in the UK for years and their system works flawlessly. You signal whether you want to turn left or right or no signal if going straight, then you signal when you exit. It makes for a for efficient system without all the confusion. Signalling when going into a small traffic circle, gives the other drivers waiting, the go ahead to also enter the traffic circle and in turn letting traffic flow smoothly. We live by two small traffic circles and nobody know’s how to use them, its absolute chaos. We almost get hit on a weekly basis from the lack of knowledge. Does signaling in a traffic circle differ from signaling in a roundabout? I believe that traffic circles are the best option to replace almost any 4 way stop. Your statistics at the beginning of this article prove that. The one problem i have seen daily is the single lane round about. At busy times it is not unusual to have cars lined up at each entrance. Yielding to the cars in the roundabout is obvious, however, it seems people are confused after that. Its simple. Like a 4 way stop. if cars arrive at the same time, if everyone yields to the right, the traffic will all enter with minimal delay. Yield to the right folks. Don’t just jam in behind the car in front. Dear TranBC Editor – can you please confirm Les’ comment? We have a new roundabout near our home where it now slows down the major traffic flow and speeds up the small local road. HOWEVER, if several cars are lined up on the major route, the people who are used to the major route will follow one another through the roundabout without stopping to yield to the person who has been sitting and waiting. I would think it is supposed to act like a 4 way stop as Les says with every one getting an alternating turn to get through without having to wait for a string of cars who are not stopping at the yield sign. Les is correct. Traffic on major route does not have priority over the traffic from the small road. All drivers should always yield to traffic in the circle, thereby allowing other drivers the chance to enter and exit the circle safely. A roundabout is just like a controlled stop and the same rules of the road apply. Hope that this helps. I live near two traffic circles (not round-a-bouts)and at both drivers are yielding to vehicles to their left. My understanding is that a traffic circle is similar to a four-way stop in that you yield to the vehicle to your right except for vehicles that are already in the circle and then they have the right of way. Am I correct? In some municipalities at traffic circles below the arrow, they have additional info stating “yield to the right”. Could this be initiated in all municipalities as ruled by the motor vehicle ministry? Thanks for you comment. Below I have provided the information from both the BC MVA and the ICBC Safe Driving guide on yielding. In terms of your comments, the four-way stop analogy is incorrect, however when No Yield signs exist at a traffic circle, and vehicles arrive at exactly the same time, Yielding to the Right is the correct approach. A big of background information too: The Ministry does not build traffic circles, just roundabouts. Even though they are roundabouts, we still consider them intersections and the rules in the BC MVA that apply to vehicle operations at intersections apply to roundabouts as well. Having said that, the Ministry developed special text tabs for our Yield signs for use at roundabouts that say ”Yield Vehicles In Roundabout.” As such, drivers on approach must yield to all traffic in the roundabout, but can still enter the roundabout with traffic in the roundabout if they determine it is safe to do so, and they do not negatively impact traffic in the roundabout. (2) Except as provided in section 175, if 2 vehicles approach or enter an intersection from different highways at approximately the same time and there is a yield sign, the driver of a vehicle facing the sign must yield the right of way to all other traffic. As a cyclist in Vancouver, I encounter a lot of one-lane traffic circles on the bike routes, none of which have any “yield” signs or other traffic control signs. I have looked at the Motor Vehicle Act and there do not seem to be any special rules for traffic circles, which means that the normal intersection rules should apply. Today I was approaching a traffic circle from the west as a car was approaching from the east. The car entered the intersection slightly before me, without having its turn signal on. I was just about to enter the circle when the car came around across my path and I had to brake to avoid a collision. The driver shouted out the window that cars already in the traffic circle had the right of way. That is consistent with what you have been telling people on this website, but as far as I can see it is contrary to what is in the MVA, which requires a driver turning left (which in effect this driver was doing) to (a) signal the turn and (b) make the turn only if no approaching vehicle is an immediate hazard (which I think I was). It may be misleading to tell people to rely on what the Ministry and RoadSense BC are saying about rights of way in these situations, if some of what you are saying is basically advice or opinion which is not legally binding on anyone. I would be interested in your response, especially if I am wrong on this point. We spoke to our traffic engineers who confirmed that roundabouts and traffic circles have different intersection designs. The points we made in the blog were specific to fully developed roundabouts. Traffic circles are found in low volume neighbourhoods and provide the function of traffic calming and intersection control. As outlined in ICBC’s Learn to Drive Smart manual, drivers should obey any posted traffic control signs (stop or yield). If no signs are posted then they are to treat the intersection as uncontrolled. Uncontrolled intersections are handled by slowing down to look out for other road users, yielding to vehicles who have arrived before you, and yielding to a vehicle turning left if you intend to go straight through the intersection. At the traffic circle, drivers should yield to vehicles that are already in the traffic circle, just as they would a roundabout. I feel like the wording yield to the traffic in the roundabout is confusing and doesn’t give a clear idea of how the roundabouts are to be used. If the rule stated ‘yield to traffic coming from the left’ there would be a clear understanding of who always has the right of way. Often on mini roundabouts there is a lot of confusion about who has reached the round about first. If everyone is yielding to the traffic to the left then a steady flow can be achieved and everyone knows who goes first. Yielding to the left would be opposite of the UK law ( yeild to traffic coming from the right) where roundabouts effectively and efficiently move traffic with little confusion. Thanks for connecting with us here Leith and sharing your idea. We will share your suggestion with the traffic engineering department. While our use of traffic circles is relatively new, we think that as people become more familiar with them, the confusion will be replaced with efficiency as you noted happens now in the UK. Of course, our traffic will always be coming from the left given our traffic moves on the opposite side of the road to the UK. At busy traffic circles, traffic in the circle are approaching from the left and have right-of-way. It is confusing to require that in a simultaneous approach the car on the right has the right-of-way. Safer to require that in a traffic circle, the car on the left always has the right-of-way … period. We are unsure of what you mean by “the car on the right having the right of way”. All vehicles must yield to the traffic inside the circle. If two cars approach the intersection at the same time, they will be headed in different directions. A multi-laned roundabout will accommodate two cars entering the roundabout at the same time, because presumably they will not be crossing paths inside the circle to reach their exit. Here’s a link to a visual with two cars entering the traffic circle in such a situation. If there is no traffic in the circle, they can both enter at the same time. Does this help? So I have been here in Vancouver two weeks now and I am alarmed at the standard of most motorists understanding of the rules of the road and lack of confidence at the wheel of a motor vehicle. Having read the above I can see why people are confused. Why is it so confusing and why is there this idea that a pedestrian always have the right of way? Its crazy to think that a vehicle leaving a roundabout should have to stop as they leave the roundabout if there is a pedestrian waiting to cross, that’s just going to lead to cars leaving a roundabout being rear ended. The roads are for cars and the pavements are for pedestrians and pedestrians should wait for a safe place to cross or gap in the traffic to cross not just walk into the road with their head down and expect everything to stop for them. I am blue light trained in the UK and having driven here for the past two weeks I am amazed at some of the ‘traffic rules’ and lack of skill and understanding at the wheel. Why does Vancouver have white stop lines in the road some 50 meters back from a traffic light? Then a sign telling you thats the stop line for the red light…..just put the line where the light is and people will know where they are expected to stop…..its not hard. The other observation I have made is Canadians being this very friendly bunch who are kind and helpful never give way when they are in a vehicle, if you do let someone out you will not get an wave of thanks. I could go on but where would I stop….I am both amazed and surprised at some of the road layouts and level of driving ability here in Vancouver, I now see why car insurance is so expensive. Formerly the rules required signaling left until you were ready to exit. When did this change? The round-a-bout in question is located in Dawson Creek. At that time it was called a traffic circle, and has since been changed to a round-a-bout. I just noticed the change recently. When did this change occur? Good question! We have sent it forward to our traffic engineering folks and will get back to you with an answer as soon as we can. We spoke with our folks in traffic engineering and they felt that the decline in the use of signals inside the roundabout coincide with the arrival of the modern roundabout (roughly around 2003). With the use of modern roundabouts (as opposed to traffic circles) traffic is required to yield at entry, whereas in an older traffic circle, traffic would stop, signal or give priority to entering vehicles. With traffic yielding outside the circle, perhaps motorists have decreased the use of signals within the circle, perhaps because they feel more protected from incoming traffic. Use of signals is always a good idea though, and roundabouts should be treated like an intersection where motorists use their signals to show their intention. Hope that this helps! I remember in the 1970’s there were traffic circles in existence in Canada. The ones I encountered had an inside and outside lane as well. The only rules I remember was that in entering the circle you yielded to the outside lane. While in the outside lane you yielded to the inside lane. I understood that this in essence would mean that you would need to yield to both lanes when entering the circle. I just want to clarify that this is indeed still the same with the modern circles. You need to yield to both inside and outside lanes while entering the circle. Correct? This appears to be contradictory and is confusing. From the right (outside) land can you exit both 1st and 2nd exits or must you always exit the 1st exit? You are right, this is contradictory and confusing! If you enter a multi-laned roundabout in the right (outside) lane, you can exit at the first (3 o’clock) exit or the second (12 o’clock) position. You choose your lane in a multi-lane roundabout the same way you would in a traditional multi-lane intersection. To go straight or right, get in the right lane. To go straight or left, get in the left lane. Hope that this helps! When preparing to exit the circle, if a pedestrian is in the crosswalk at your exit, is it safe to stop while still in the circle? Or should a vehicle continue around the circle a full 360 degrees to re-attempt the exit at the desired point? Good question! If you look at this simulator: http://www.th.gov.bc.ca/roundabouts/index.html you will see that pedestrian crosswalks are located outside of the traffic circle itself. This means that you shouldn’t have to circle around again, but rather exit the circle, wait for the pedestrian and proceed. Hope that this helps! Thanks! I had this situation of a pedestrian in the cross walk at the exit I wanted to take recently (twice on the same weekend). I was on a motorcycle (practising for my road test). Both times I did basically as you described…getting close enough to the cross walk before stopping so that I wasn’t blocking the circle lanes. But, there was not a lot of room there…I could imagine a larger car/truck would end up blocking circle lanes…but I guess that then falls under “Don’t not stop in the circle UNLESS traffic conditions require it”. Thanks for sharing your concern with us. We have forwarded your concern to our Traffic Engineering Department. Just looking into the MVA and we were wondering if you could clarify which part of the legislation you found this rule? Your graphic “A Bird’s Eye View” shows 2 lanes in and 2 lanes out at all roads. (3, 6, 9, 12 o’clock) All entries show the left lane able to exit at any of the other roads, and the right hand lane either taking the next right, or driving straight through. My question is, who has right of way when a vehicle in the left (inner) lane of the roundabout wishes to exit at say the 3o’clock position, and a vehicle in the right lane who has just entered the roundabout at the 6 o’clock position has decided to carry on straight through to the 12o’clock road. The vehicle in the right lane has effectively blocked the exit of the vehicle in the left lane from taking the 3 o’clock road. Other countries I have driven in enforce the requirement of drivers in the right (outer) lane to exit to the right at the next street. This allows vehicles in the left (inner) lane to exit the roundabout into the left lane at whichever street they wish, without the concern of colliding with a vehicle in the right lane that has decided to travel straight through the roundabout. Proper lane selection before entering the roundabout would be important in deciding which exit you will be taking from the roundabout if the right lane was only used for immediate right turns. I find this anomaly disturbing. The traffic inside the circle always has the right of way. The yield sign at the entrance to the circle means “Yield to ALL traffic in the circle”, not just the traffic in the lane you want to enter into”. The vehicle in the circle looking to exit at the three o’clock position should be allowed to pass by the vehicle waiting outside the circle (the vehicle wanting to exit at the twelve o’clock position). If the traffic outside the circle yields to the traffic inside the circle there should be no chance for collision. If this were a traffic light controlled intersection and you were looking to travel straight through, the light would make sure that there was no traffic coming from your right before you entered into the circle. The same is true for the roundabout but the onus is on the driver entering the circle to be sure of where they are going, what lane they chose and that they enter the circle only when it is safe to do so. The driver entering the circle at the three o’clock position will do the same thing, looking for traffic at their left before they enter the circle, etc. Make sense? Let us know if you have any other questions. Thanks for connecting with us here. Not only is lane selection important so is signaling your intention at the roundabout of which I would estimate 98% of drivers fail to do in Canada that I’ve witnessed. Dear webteam, Change remove the line height from #leftcontent so the text isn’t so squished together and hard to read. Thank you. Updated. Thanks for the heads up – much appreciated. Someone has tried to insist that signaling a left turn upon entering a roundabout is the correct way to ENTER if you would be exiting at the 9 o’clock position but said you keep your left signal on the whole way. I referred them to this site. You’re supposed to signal left until your exit then signal right to exit. Thanks for sharing your experience. Drivers entering a roundabout might signal as a courtesy, although it is not required, because vehicles entering a roundabout always turn right (as traffic in the roundabout travels counter-clockwise). The BC Motor Vehicle Act requires drivers to signal only if their manouevre impacts another vehicle. 170 (1) If traffic may be affected by turning a vehicle, a person must not turn it without giving the appropriate signal under sections 171 and 172. Which says drivers must signal yet no one does hence defeating the purpose of a roundabout. Not only is it courtesy to signal, it’s a safety issue AND creates a smoother more efficient flow at a roundabout. Coming from a country where we have millions of roundabouts, they do not provide what they are designed to do effectively here. When you approach a typical intersection you signal as to what direction you going in. In Canada your roundabout is the anomaly where no one signals even though you are turning. This is the single most frustrating rule on your roads. It all comes down to guess work and inefficient traffic movement which defeats the purpose of the function of a roundabout. However, you should only ever need to yield to the inside lane and only when getting on because the outside MUST get off just before you get on. The flow of traffic in a roundabout is counter clockwise which means you will always be entering and travelling to the right. Hope that this helps. “The traffic circle only allows vehicles travelling in the right hand lane the option to turn right as soon as they enter the circle or go straight out at the twelve o’clock position (from the right lane -because this is a two lane in, two lane out circle scenario).” My husband and I were in the right lane of a roundabout trying to go straight out at the twelve o’clock position. We were hit by someone in the left lane exiting at the three o’clock position, and both the policeman and ICBC said we were at fault. Could you please explain this to me? Sorry but you are at fault. If you are in the right (outside) lane, it is not an option but rather mandatory that you exit at 3 o’oclock which is the next exit. The left (inside) lane can leave at any exit but it is generally meant for going more than one exit. In this way, the outside lane is basically a straight through without stopping, very quick. The inside is quick too because it can get out whenever without being concerned about the outside lane. … you were not in the wrong if you were in the right lane intending to (pass by the 3 o’clock exit and) exit at 12 o’clock (though could have been in the wrong, regarding the collision, for various other reasons – particularly failure to yield). Also, if it were true that the right lane must exit at 3 o’clock then the line separating the right and left lanes that leads out the 3 o’clock exit would be solid, not dashed (ie. indicating right lane not allowed to cross it). What roundabout did your collision occur at? I want to look at it in streetview. How does one go about requesting having a roundabout placed in their community? If the roundabout is within the municipal boundary, you would likely approach your city municipal hall. If I can exit the circle from the left lane and I can go straight through in the right lane then who has the right of way when I exit from the left lane and there is a car beside me in the right lane? Good question! (and sorry for the delay). If you are entering the traffic circle in the left lane, you are permitted to exit the circle at the twelve o’clock, nine o’clock and six o’clock points on the circle from the left lane (with the six o’clock point being a u turn). The traffic circle only allows vehicles travelling in the right hand lane the option to turn right as soon as they enter the circle or go straight out at the twelve o’clock position (from the right lane -because this is a two lane in, two lane out circle scenario). If you and the vehicle wanted to exit at the twelve o’clock position, you would be exiting side by side out of the circle at that point. A vehicle travelling in the right hand lane beside you should not be going any further than the next exit, and should not pose a threat to you in any way. Here are some videos to help clarify the use of lanes within the traffic circles, and of course if you have any other questions, please let us know. Thanks! “If you are entering the traffic circle in the left lane, you are permitted to exit the circle at the twelve o’clock, three o’clock and six o’clock points on the circle from the left lane”. …illustrate that the left lane can exit at 12,9 and 6 (and NOT at 3). Thanks for the catch! You are right, if you enter the traffic circle in the left lane, you can exit at the twelve, nine and six o’clock points. Before asking my question I have a comment; I have read through the list of comments and replies above and found many errors and inconsistencies (e.g. it is not a requirement to signal left while in the traffic circle). It would be helpful to edit these comments and replies to correct the ones that are wrong (e.g. through a reply). It might even be best to add a summary of the rules to the beginning of this topic page. My actual question has to do with the multi-lane roundabouts. The main site http://www.th.gov.bc.ca/roundabouts/ does not specifically address these and this does lead to some lack of clarity. Consider the case of two vehicles that enter the traffic circle at the same time. One coming from the west heading east and the other coming from the south heading north. Suppose the driver heading east enters in the left (inner) lane and the driver heading north enters from the fight (outer) lane. Depending upon the speed of the two vehicles there may well be a point of collision when they intersect at the east exit. Here the northbound driver wants to continue in the right outer lane while the eastbound driver is attempting to cross that inner lane in order to exit eastbound. Who is required to yield? The rules only state to yield to traffic already in the roundabout. Since both vehicles entered at the same time neither was required to yield. This happened to us and we had to stop suddenly to avoid a collision with the driver in the inner lane as they crossed our lane to exit. This statement is valid IF both cars entered at the same point (e.g. at the south) of the roundabout. However, what about the case where one car enters from the West and is heading East and selects the left lane. and at the same time another car enters at the South and and is heading North and selects the right hand lane. Here there will be a point of intersection when the Eastbound car tries to exit from the left lane across the path of the northbound car that is in the right hand lane. I have seen this happen and I am sure that accidents can and do result. Which car has the right of way? Vehicles within the roundabout have the right of way. Prior to entering the roundabout you must ensure that your actions are not going to impede vehicles always in the roundabout. There are any number of conditions that can occur in roundabout operation. Use due care and attention while driving through roundabouts. All movements are low speed and allow drivers to judge and negotiate safely. Hope that this helps. For the situation above (which is indeed very common; vehicles may enter at the west and south sides at the same time and still end up at the east exit at the same time, if the roundabout is quite large and perhaps the inner car is going faster). If I’m the outer car, I would be keeping an eye on the inner car’s signal. However, if they don’t signal, and we still end up at the east exit at the same time and I’m in the outer lane continuing to the north side… who has the right of way? I struggle with the answer that it’s “whoever was in the roundabout first” because we may have gone in at the same time. If there are two lanes in the round-a-bout, and you enter on the right, when would you use the inner lane? It seems to me that when leaving the round-a-bout, I should be in the outside lane and keep right as opposed to entering from the right, going to the inner lane and then exiting from the inner lane. Which is the correct way? Thank you. Your answer is confusing. If you can never change lanes in a roundabout, I assume everyone is in the right hand lane. So what is the second lane for? Sorry to confuse things. One of the most important things to remember about roundabouts, is that you should decide which lane you will be travelling in before you enter the roundabout. Modern roundabouts can have multiple moving lanes within the circle. If you have decided which lane you want before you enter the circle, there should be no need to change lanes while inside, as the lane you chose should lead you out correctly. The second lane would be for people who are entering the circle only to turn right at the next road (something similar to a right hand turn lane in a normal traffic intersection). Here are some videos to help clarify the use of lanes within the traffic circles, and of course if you have any other questions, please let us know. Thanks! Finally someone mentioned the key rule to round abouts, although it took them 2 messages and near the end. Along with never change lanes, the outside lane must exit at the next turn which means the inside lane can always exit as well without being concerned with stopping and worrying about colliding with the outside lane. For some reason the people doing the round about rules on the government websites do not seem to have a clue about this key rule that makes round abouts efficient and safe! !